"Fine, I can talk. Now let's see if you can listen." DreamWorks Animation has released the first teaser trailer for their next new comedy movie, titled The Boss Baby, from the director of the Madagascar series and Mastermind. Alec Baldwin voices the adorable little baby, seriously called just "Baby" in the film, who is a suit-wearing briefcase-carrying kid that teams up with his seven-year old brother to stop the dastardly plot of the CEO of Puppy Co. Other voices include Miles Bahski, Jimmy Kimmel, Lisa Kudrow, Tobey Maguire, and Steve Buscemi. This teaser makes it look like there is quite a bit of tension between the baby and his brother, but it seems like they'll probably end up friends by the end. What do you make of this? He wears a suit, speaks with the voice and wit of Alec Baldwin, and stars in the comedy, DreamWorks' The Boss Baby. The Boss Baby is a hilariously universal story about how a new baby's arrival impacts a family, told from the point of view of a delightfully unreliable narrator, a wildly imaginative 7 year old named Tim. With a sly, heart-filled message about the importance of family, DreamWorks' The Boss Baby is an authentic and broadly appealing original comedy for all ages. The Boss Baby is directed by American filmmaker/animator Tom McGrath, director of the Madagascar trilogy and Megamind at DreamWorks previously. The screenplay is written by Michael McCullers, based on the children's book by Marla Frazee. 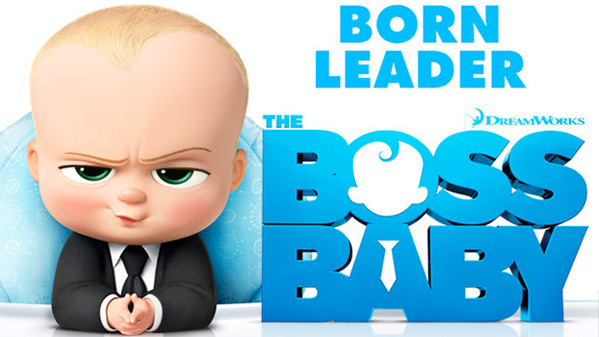 20th Century Fox will release The Boss Baby in theaters starting on March 31st, 2017 next year. Anyone? This could have failed so hard, but Alec Baldwin is making it work (somehow). Y'all are probably going to hate me for this, but... I see a lot of Chuck Jones, in this. Weird. I thought it looked OK *until* the baby started talking. Pass.